Charles F. Davis, former Police Chief of Somersworth and the last member of the local Grand Army of the Republic, passed away July 9,1937, thus adding another post to that vast army of the G.A.R., who have fought their battles, completed their rolls, and past into history. Mr. Davis has been remarkably active and enjoyed excellent health until within a few weeks and death came suddenly after a short period of illness. 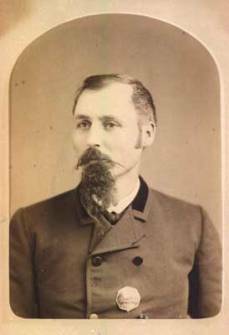 Davis was born at Wayne, Me., on December 20,1847, the son of Mr. and Mrs. Edmund Davis. The family moved to Winthrop, Me., when Mr. Davis was very young and here he received his education. At the age of 18 he came to Somersworth where he has since made his home, and went to work at the Great Falls Iron Foundry. Later he served the city for many of years as chief of police and was at one time during the early years of the appearance of the electric cars here, a conductor on the Somersworth and Dover Line. As a young man Mr. Davis was an ardent lover of horses. Always owning a number of thoroughbreds was an enthusiastic horseman and an accomplished jockey. Mr. Davis’s wife, who died a number of years ago, was the former Mrs. Evelyn Davis. The deceased saw service during the Civil War and enrolled in Company F, 11th Regiment, Me., Infantry. Besides being the last member of the local G.A.R., of which he was a former commander, he also was the oldest member of the Libanus lodge of Somersworth. He leaves a sister, Mrs. Abbie D. Ramsdell of Eastport, Me., a niece, M. Estelle Ramsdell, master’s assistant in the public schools of Cambridge, Mass, a cousin, Herbert Davis of Berwick, Me., and a brother’s widow, Mrs. Mary Davis of Tottenville, NY. Flags at half-mast dotted the streets in honor of the deceased whose remains were escorted by an honorary delegation of the American Legion and a detachment of police, to the Memorial hall, where impressive funeral services were held at 2 o’clock. The American Legion was in charge of the guard during the two-hour period while the body lay in state at the hall previous to the funeral service. Rev. Elmer West, pastor of the United Baptist church, officiated and full Masonic rites were accorded by members of the Libanus Lodge, A.F. and A.M. At the grave in Forest Glade cemetery the committal service was conducted by Mr. West and final military honors given by the American Legion with farewell volleys by the marine firing squad from the Portsmouth Navy Yard who also played taps. Clarence Bell, Frank Howe, Albert Colburn and Fred Legro represented the Masons. Henry Mullen, James Perreault, Placide Lagueux and Thomas Hanagan of the American Legion acted as bearers.